Experienced developers use a variety of techniques to simplify their coding and maintenance efforts. Some of the tricks are general programming styles and conventions, while others are specific to the characteristics of Visual Basic (VB6) and Microsoft Office/Access VBA. Hopefully, by adopting such "best practices" techniques, you'll be able to write code that's easier to write, debug, and understand. Not only can you reduce bugs during development, you can also significantly reduce the effort required to replicate and fix bugs your users encounter. A consistent coding style is critical for efficient application development in multi-developer environments. It also increases the chance that future developers can understand your work to fix or enhance it. Debugging is one of the most important skills for a developer. Software development is all about writing code, making mistakes, and fixing them. Strong debugging skills minimizes the development cycle by allowing developers to pinpoint bugs quicker, make fixes that actually address the problems encountered, and verify the modifications are correct. This is particularly important as the code gets more complex. Debugging doesn't end when the application is shipped. Having the proper error handling in place is critical to providing quick support when users encounter crashes. At the very least you want to verify it's a problem in your application, and if so, as much information as possible so you can minimize the need for user recall on how to reproduce the bug. Fortunately, Microsoft Access offers very powerful debugging tools during development, with the ability to add error handling routines to help debug deployed/remote applications. Assuming you're not running an MDE, when you press Debug, you enter the IDE at the line where the crash occurred and have the opportunity to examine the problem. Another important use of the debugger is during system development to verify the code is working correctly even if a crash doesn't occur, or to narrow down the situations where a crash occurs. The Microsoft Access/VB6 debugger lets you step through each line of code as it runs, examine the environment (including all variables), and even change variable values and lines of code! By seeing how your code runs (which procedures get called, which IF statement branch is taken, how loops work, etc.) you gain a much better understanding of how your code work and whether it's behaving as designed. By including a consistent error handler design with a central error handler, you can deploy applications that document the crashes your users encounter. This is particularly important if you have many remote customers and can't easily go to the offending desktop when the user calls. With a sophisticated error handler, you can document not only the error, but other important information such as the procedure name, procedure call stack, line number where the crash occurred, and other Access environment information. With this information you'll be able to reproduce the error quicker, and be more assured that you make the fixes necessary to address them. Most importantly, you'll minimize the often frustrating process that developers and users face when trying to reproduce crashes. Professional applications need to include error handling to trap unexpected errors. By using a consistent error handler, you can make sure that when crashes occur, the user is properly informed and your program exits gracefully. Basic error handling just hides the default behavior and exits the program. Advanced error handling can include all sorts of features such as saving information about the cause of the error and the environment at the time, attempts to address the problem, and information for the user on what they need to do next. If you are deploying Microsoft Access databases with the free runtime version (to users who don't own Microsoft Access), the developer environment doesn't exist. In such situations, you need to have an error handling system in place to capture errors and gracefully exit your program should it crash. Visit our Microsoft Access Runtime Distribution and Free Downloads page for more info. Before you can use error handling, you need to understand the Error Trapping setting. 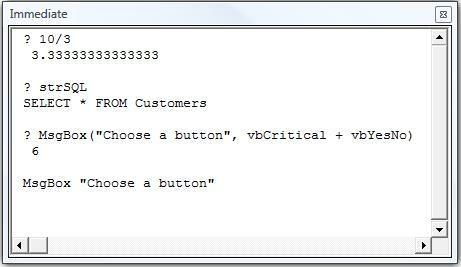 VB6/VBA lets you to determine how it should behave when errors are encountered. From the IDE, look under the Tools Options setting. 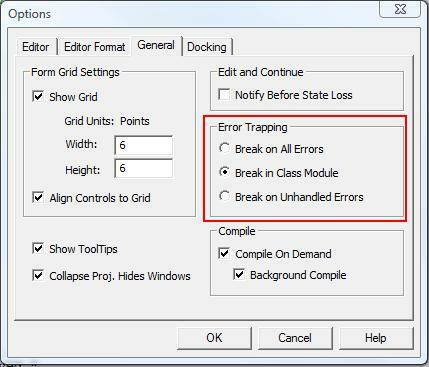 Make sure error trapping is not set to "Break On All Errors". That setting will cause your code to stop on every error, even errors you are properly handling with "On Error Resume Next". "Break on Unhandled Errors" works in most cases but is problematic while debugging class modules. 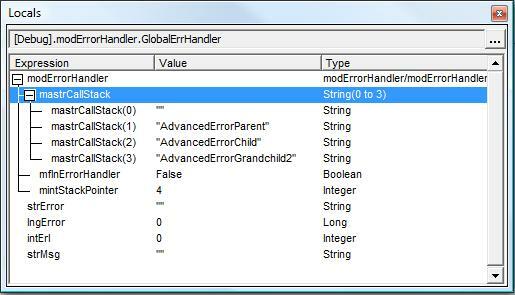 During development, if Error Trapping is set to "Break on Unhandled Errors" and an error occurs in a class module, the debugger stops on the line calling the class rather than the offending line in the class. This makes finding and fixing the problem a real pain. I recommend using "Break in Class Modules" which stops on the actual crashing line. However, be aware that this does not work if you use raise errors in your classes via the Err.Raise command. This command actually causes an "error" and makes your program stop if Error Trapping is set to "Break in Class Modules". Unfortunately, users can modify this setting before launching your application so you should make sure this is properly set when your application starts. Programmatically, the option settings can be viewed and modified using the Application.GetOption and Application.SetOption methods. strSetting = "Break on All Errors"
strSetting = "Break in Class Modules"
strSetting = "Break on Unhandled Errors"
Always include code in your startup routines to set the appropriate error handling level. Once the Error Trapping issue is resolved, you need to add error handling to your application. 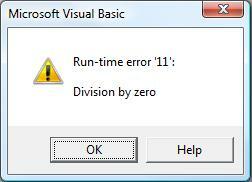 Unfortunately, VB6/VBA does not support a global error handler to manage any errors that arise. You actually have to set error handling in every procedure. Without explicitly adding error handling, VB6/VBA shows its default error message and then allows the user to debug your code or just crashes. If an error occurs in the procedure, the code jumps to the line where the label "PROC_ERR" is defined. For consistency, use the same label name in every procedure. Here you can manage the error and determine what to do next. Examine the error object (Err) to see what occurred. For instance, Err.Number is the error number, Err.Description is the error description, etc. In some situations, you need to turn off error handling. For instance, you may want to see if a file exists. By looking for it and managing the error if it can't be found, you can determine whether it exists or not. Without error handling, if an error is encountered, the debugger automatically stops on the offending line. This is great for debugging and correcting mistakes. However, if error handling exists in the procedure, when an error occurs, rather than stopping on the offending line, the code in the Error Handling section is invoked. This makes debugging much more difficult. Set this constant to False during development, and True when you deliver your application. That way, your users get the benefit of the error handling and you can get your work done without it. The error number, which is useful for testing. Zero means no error. The built-in description of the error. Sometimes this doesn't exist and this text "Application-defined or object-defined error" is given. This still may not be understandable by the user, but can be very helpful in diagnosing the problem. Click here for a list of all Microsoft Access Error Numbers and Descriptions. Alternatively, you can set the error number to zero (Err.Number = 0), but is not as effective as the Clear method since it does not clear the description property. MsgBox "The file " & strFileName & " does not exist." MsgBox "The file " & strFileName & " is in use." allows the program to continue (go to the next line) even when a command cannot be executed. The Kill command triggers an error if the file being deleted doesn't exist or is locked. We don't care whether the object exists or not. We just want to delete it if it does. Therefore, the command to ignore the error (Resume Next) is appropriate. Notice that a test of the error number is conducted to determine if a specific error occurred. That is, we consider it okay if the object could not be found. However, there are other reasons that may cause a failure to delete an object that exists (for instance another user has the object open, insufficient rights to delete it, etc.). Error handling only handles well-behaved errors: errors that trigger an error number in code. Technically, these are the only types of errors you can have, but we all know that Access can crash with a GPF. Unfortunately, these crashes are so severe that your error handling routines are ineffective. Put the cursor on the variable, procedure, or property in question and press [Shift F2] to see where it's defined. You'll jump directly to it. You can do this as often as you like to understand how your code works. Press [Ctrl Shift F2] to go back to where you came. Highlight the procedure you want to run and press [F5] to run it. If you want to step into it line-by-line, press [F8]. More explanations on running code line-by-line is given later. Of course, running a procedure this way only works if you don't have to pass parameters to it. If you need to, consider using the Immediate Window. Breakpoints are placed on the lines in your code so the debugger is invoked when the program tries to execute that line. A breakpoint can be placed on any line that is actually run (not lines in the General Declarations section, or lines that define variables in a procedure). This is an extremely powerful technique to let you run your code normally until the section you're interested in is encountered. Breakpoints can be added by moving to the line desired and pressing F9, clicking with the mouse on the left border, or from the Debug menu. Multiple breakpoints can be added during your debugging session. Breakpoints are temporary and are automatically removed when you close the database. Once you are in the debugger and stopped on a line whether it's from selecting Debug from the crash menu or a breakpoint, you have the opportunity to see the "guts" of your program. Simply move your cursor over variables to see their current values. You can also use the Immediate Window or the other Watch windows to be described later to understand all the values. Run the current line and go to the next one. Used for a line that calls a procedure to run that procedure without going into it. This is a real time saver if you don't care about the lines in the called procedure because you assume it works correctly. The command lets you run the procedure (and any procedures it may call), and go to the next line in the calling procedure. Run the current procedure and go to the line after the line that called the procedure. This is basically a way to simplify the debugging process by letting you skip the remainder of the current procedure once you realize you don't need to step into it any more. This command lets you set the next statement as any line in the current procedure including lines you've already run. This is extremely powerful and quite amazing when you think about it. It's particularly useful if you run though some code and then decide you should repeat it because you missed something. It's not always the same as the first run because variables may have changed, but if you understand the situation, it lets you debug again without getting to the same code or situation again. Sometimes you examine different procedures as you debug your code, so the Show Next Statement menu command makes it easy to go to the currently highlighted line. The call stack keeps track of the procedure calling chain so you can easily see how you got to the current procedure through all the other procedures. Retrieve it under View, Call Stack, or press [Ctrl L]. From this dialog, you can click on any procedure and jump immediately to it. Before analyzing the details of the current procedure, it may be more important to understand how and why you got there since the problem may be there rather than in the current procedure. the Immediate Window runs the function, then shows its return value. Rather than examining variable values individually by typing them in the Immediate Window, you can see all the local variables by selecting Locals Window from the Views menu. This displays the entire list of local variables and their current values. Local variables are variables defined in the current procedure and module declaration section. Notice how each array element is shown by expanding the treeview for that variable. You can modify the value held by a variable by clicking on the Value column and editing it. This is an alternative to modifying values from the Immediate Window. 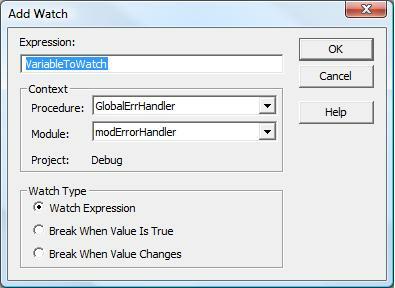 The Watch Window is similar to the Locals Window, but you specify the variables you want to track. You can track variables across modules and procedures and keep them in your Watch Window to see their value no matter where the current line is. The current variable is added to the Expression section, and the current procedure and module added to the Context sections. If you press [OK], this variable is added to the Watch Window and you can see its value whenever you look at the Watch Window. What's most powerful about adding watches is that in addition to variables, you can also add expressions, and options to break when the value changes. The latter is particularly powerful when you are having trouble determining why a particular situation arises in your application. Maybe a variable is set in multiple places and you can't tell which instance is causing the value to change. By setting the Watch Type option, you can quickly stop when this occurs. This stops the debugger on the line immediately after the value of the variable/expression changes. and when the variable becomes 500, the program stops and lets you start debugging from there. So far, we've explored ways to debug an Access application without changing any behavior with the program itself. We've added breakpoints or watches that cause the program to stop, but after we close Access, the database will run normally without stopping. Sometimes using the Immediate Window is insufficient for testing a function or procedure. Maybe you want to test it multiple times and don't want to enter it each time on the Immediate Window, or maybe the procedure call is too complex to use in the Immediate Window. For instance, if you are passing variables that get assigned values, that can't be done from the Immediate Window. Similarly, the procedure you are testing may require calling lots of other procedures in advance to set up the environment before you can run it. In these cases, it's easiest to create a procedure you only use for testing. This can be a real time saver if the code you are testing is buried deep in a process and you don't want to run the whole program to get there. It's not as good as stepping through each line, but maybe this is all you need initially to see if a particular routine is running properly before narrowing your search further. the debugger stops when x is 5. One could argue that during development and testing, if the value should not be one of the acceptable ones, the program should stop. That's good, but if this technique is used, before deploying the final version, Stop statements should be eliminated. Far better to have an error arise and trap for that than a program simply stop for the end-user. Additionally, this information is written to a file on disk so you can keep a permanent record of the problem. Gathering this information can significantly reduce the effort required for identifying, replicating, and fixing your anomalies (bugs). Unfortunately, while VB6/VBA tracks the procedure call stack and lets you examine it under the View, Call Stack menu item while debugging, this information is not available to your code. The only way to generate this is to track it yourself. Since VB6/VBA does not have a current procedure name function, the procedure name needs to be explicitly added when the PushCallStack procedure is called. Notice how the PushCallStack procedure is invoked at the beginning of the procedure with the name of the current procedure as a parameter. The PopCallStack is called at the end of the procedure to remove the current procedure name from the stack when the procedure completes successfully. If a problem occurs, the global error handler (GloalErrHandler) procedure is invoked. In most cases, the global error handler will exit the program, but if for some reason it doesn't the code is designed to exit this procedure. For this process to work, procedures may not quit without going to the bottom of the procedure. That is, you can't have code such as "Exit Sub" or "Exit Function" in the middle of your procedure; otherwise, the PopDebugStack routine will not be invoked and the procedure name remains on the stack. An error module should contain your error handling routines.
' Comments: Add the current procedure name to the Call Stack. Of course in a simple procedure, the line number does not offer much, but in a larger more complicated subroutine, knowing which line crashed can save considerable time and effort to replicating and fixing the problem. Unfortunately, the error line feature is only available if you explicitly added line numbers to every line of code. This is nearly impossible to do manually for all but the simplest databases. Use our Total Visual CodeTools program to do this. Any other information about Access, the Access workspace, operating system, memory, disk space, DLLs, where files are located, etc. that may be useful for your diagnoses. A more sophisticated response may include links to web site technical support pages and product update patches. Customize this to best serve your customers based on their abilities to troubleshoot errors. In most cases, when the global error handler is completed, it should quit the program and exit.
' Comments: Main procedure to handle errors that occur. Writing to text file is simply using the Print # command. You need to determine the name of the text file and which directory it should be placed. In general, we place the error.txt file in the same directory as the application database. However, you may want to put it in a shared network directory (such as where the linked data database is located) or a specific error location. A text file is the best option for storing error information. Other options such as writing the data to a table or sending an email may fail in error situations (especially out of memory errors). Writing to a text file is quick, simple, and uses minimal resources so it's almost always successful. Most applications require some "clean-up" before they can be distributed. Resetting properties to "default" values, emptying tables, copying objects, deleting temporary or test objects, incrementing version numbers, and a variety of other steps may be necessary before you can deploy. Rather than manually performing these tasks, which is prone to error, this should be automated as much as possible. Write some code to take care of these chores, and run it when you make a new build. Before delivering your application, make sure your debugging code is removed or disabled. Code such as Stop; Debug.Print; Debug.Assert; should be eliminated or put into sections that won't be invoked. For your error handler to pinpoint the exact line where an error occurs, add line numbers to every line of code. Obviously, this would be difficult to do manually. This is one of many features in FMS's Total Visual CodeTools. To maintain your application over time and to track changes by version, you need to document it. Some of this can only be done manually, but automated tools can help you document your application plus detect problems that would otherwise be very difficult to detect. FMS offers many of the leading tools in this area. MicrosoftAccess database documentation and analysis. Generates complete object and code cross-reference. Know where procedures and variables are used. Detects 300+ types of errors and suggestions including unused objects, unused code, procedures without error handling, procedures that should be private, and much more. Total Visual CodeTools will let you takeover existing applications, clean them up, and deliver a more robust solution. The Code Cleanup feature standardizes code indentations, adds your error handling to procedures that lack it, adds comment structures, sorts procedures, etc. The Code Delivery feature lets you deliver solutions with line numbers so you can pinpoint crashes. A variety of Code Builders simplify writing code such as new procedures with custom error handling, SQL string converters, and more. FMS also offers source code libraries that eliminate the need to write a lot of code from scratch including code for robust error handling in your applications. Hopefully, the tips and techniques presented here will help you create better MS Access and VB6 applications faster. Access and VB6 offers extremely powerful and flexible debugging tools and you should take advantage of them to minimize the time between discovering an error and fixing it. With the proper error handling methodology and delivery preparation with line numbers, you can also debug and fix errors in deployed applications.